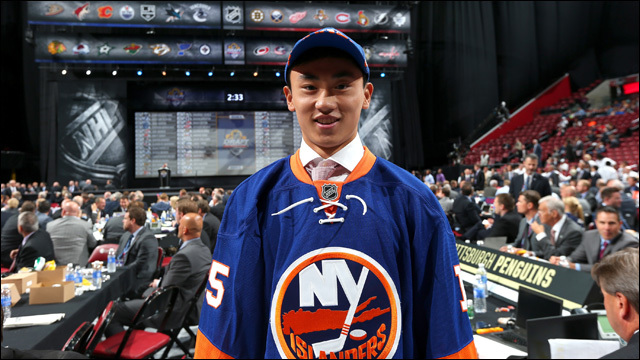 Last week at the 2015 National Hockey League Entry Draft, the New York Islanders made history by selecting the first Chinese-born player to be drafted into the NHL. Yes, there are Chinese dudes who play hockey. 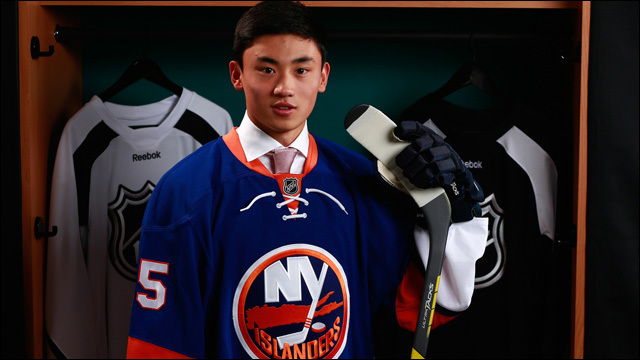 18-year-old Andong Song, who was born in Beijing and moved to Canada with his family when he was 10, was selected by the Islanders in the sixth round with the 172nd pick. The 6-foot, 161-pound defenseman, who was assistant captain with the varsity team at the Lawrenceville School in New Jersey, had three goals and seven assists in 26 games. Next year, he'll play at Phillips Andover Academy as a postgraduate. After that, he expects to play college hockey. Song also plays internationally, captaining for China this year at the 2015 U18 World Championship DII. He says that interest in hockey has been growing rapidly in China. "Being the first Chinese player, it's a lot of pressure from people back home, but good pressure," Andong said. "I hope that will motivate me to become a better player and hopefully I'll make them proud." One of his earliest memories is watching the U.S. play against Russia at the Salt Lake City Olympics in 2002. China is trying to land the 2022 Winter Games, which is one of many reasons why the game seems to be growing there rapidly. "When I started playing there weren't a lot of people playing there and not much support for the game," said Andong, whose brother still plays in Beijing. "But last year when I went back, it'd been like eight years since I've seen Chinese hockey, it's just been tremendous how far they've grown. I'm sure they'll keep trying to catch up to North America and Europe and Russia, but there's still a little gap." No doubt, Song's historic selection will help spur even more interest in the sport.